Which Theme Parks Have the Most Roller Coasters? Do you want to know which theme parks and amusement parks across the globe have the most number of roller coasters? You've come to the right place. I've compiled a rundown of the ten parks that boast the biggest arsenals of thrill machines. Because some of them are tied, they are ranked, in reverse order, from the fifth position to the park with the most coasters. Nearly all of the parks on the list are in North America. And of the ten parks, eight of them are in the United States. (The other two are located in Canada and Germany.) We're crazy over coasters in the U.S. In case you're wondering, there are other parks in Europe and Japan that almost made the list (as well as other U.S. parks) with 12 coasters. Hersheypark has been open since 1906 and has an impressive collection of coasters. Its oldest one, Comet, dates back to 1946. Among its standouts are the racing/dueling coaster, Lightning Racer (a top-10 woodie), as well as Skyrush, Great Bear, and Storm Runner. In 2015, Hersheypark introduced Laff Trakk, a hybrid coaster and dark ride. Another park with a top-10 best coaster, Great America is overflowing with thrill rides and screaming passengers. Highlights include Goliath, which earned the distinction of being the world's fastest, tallest, and steepest wooden coaster when it debuted in 2014 (and is the ride that ranks among my top-10 best). Other notable rides include X-Flight, a wild "wing" coaster, the impulse coaster, Vertical Velocity, and the delightful wooden kiddie coaster, Little Dipper. More: The 9 best rides at Six Flags Great America. Among its impressive lineup of roller coasters, Intimidator 305 tops the ticket. (You get three guesses for its height.) Other standouts include Volcano, The Blast Coaster, a unique inverted, magnetic launch coaster, Flight of Fear, an indoor launch coaster, and the floorless Dominator. Operated by the Mack Family, which also runs Mack Rides, Europa Park serves as a testing ground for the ride manufacturer's latest roller coasters and other innovations. It is also the second largest theme park in Europe behind Disneyland Paris. Many of its rides are highly themed, including Arthur (pictured), an inverted roller coaster that includes dark ride elements and tells the story of Arthur and the Minimoys. 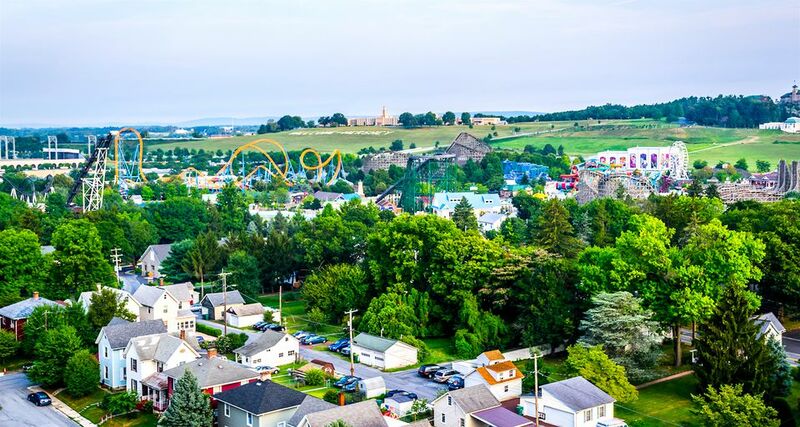 One of Six Flags' flagship parks, Great Adventure has a mighty impressive lineup of rides including the record-shattering Kingda Ka and the top-10 duo of Nitro and El Toro. For 2016, it will introduce Total Mayhem (pictured), a "4D Free Spin" coaster. Diamondback an airtime-loaded hypercoaster is among the best steel coasters in North America (IMHO). The legendary The Beast is one of the most famous wooden coasters on the planet. In 2014, Kings Island introduced Banshee, a highly regarded thriller with seven inversions. For a while there, Cedar Point (which bills itself as "The Roller Coaster Capital of the World") was duking it out with the top park on the list for coaster supremacy. The Ohio park eventually blinked (although 17 roller coasters is nothing to sneeze at). But it continues to build new rides (such as GateKeeper in 2013 and Valravn in 2016) and improve older ones (such as Rougarou in 2015 which refashions the stand-up coaster, Mantis, as a floorless model). Among its other wonderful coasters are Maverick, Magnum XL-200, Millennium Force, and Top Thrill Dragster. And the number one park for the most number of roller coasters -- at an astounding 19 -- is (sound of timpani roll)... Six Flags Magic Mountain (sound of cymbal crash)! It started with a cute theme about gnomes who lived in a Magic Mountain, but the California theme park evolved into a big, bad, scream-filled, coaster haven. Its arsenal features Superman: The Escape, a launched shuttle coaster that reaches 100 mph, Tatsu a well-regarded flying coaster, and X2, the world's first 4th-dimension coaster. In 2015, it gave a radical makeover to its classic Colossus and unleashed the hybrid Twisted Colossus.